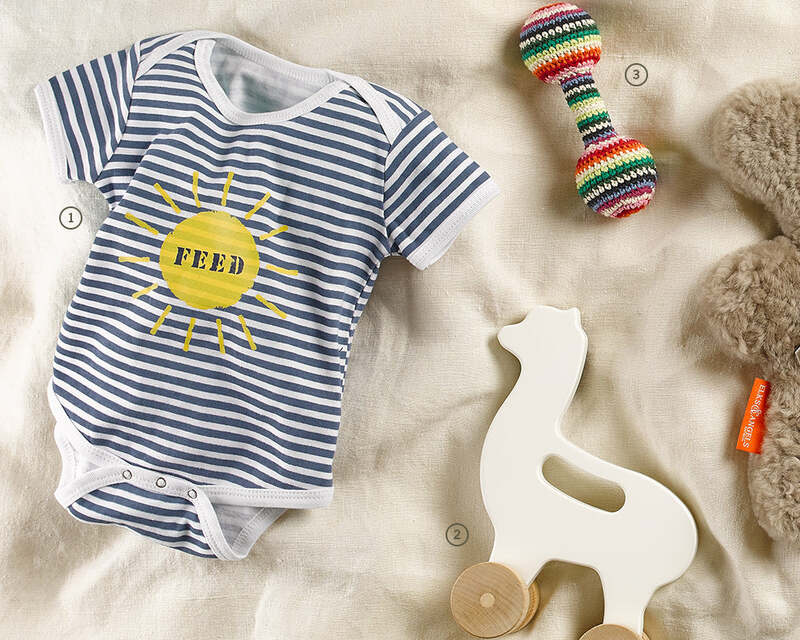 FEED Onesie Dress your little one in this adorable (and brand new) FEED onesie and give meals to littles around the world. Because it’s never too early to help those in need. Crocheted Rattle Crocheted by artisans in China, this colorful rattle takes three days to make, and thus, provides three days of employment. We love Anne-Claire’s commitment to boosting the economies of rural communities in Northern China. Also, it’s the happiest thing we’ve seen all week. Wooden Alpaca Toy The design for this eco-friendly wooden Alpaca push toy from Manny and Simon was inspired by an Alpaca ranch in New Mexico. Awesome, right? Who doesn’t love an Alpaca? Beyond its cuteness, we feel good about giving it to our babes as it’s made of sustainably harvested Maple and is colored with non-toxic, water-based paint. Elks and Angels Cuddle Bear Let us just say that after picking up this little guy for our photo shoot, we could not put him down. This sweet sheepskin bear is as practical as it is soft, given that it is flame retardant, anti-bacterial and hypoallergenic. We’ve heard from our parent friends that it is also comforting for their babies to hold. Honest Body Wash We are big fans of The Honest Company at the FEED HQ (remember this fun diaper bag collab we did?). This all-natural, organic body wash is tear-free, plant-based and perfect for both mom and baby. Star Blanket Lauren stocked up on this sweet bird print receiving blanket from Stella McCartney. 100% organic, it’s part of a larger set that includes an adorable footed body suit and a cap. This is our newborn gift pick. Doughnut Toy Right? We want to buy one of these for every child we know. Hard to believe, but the impact behind this Instagram-worthy toy is even more special than the design. Made in rural Bangladesh by talented artisans who have jobs that allow them to work close to home and care for their families. Each one is made entirely by hand with natural materials, so they are all a little different. Hello Sacred Life book Those of us with kids know that board books are the way to go (fact: it’s easier to turn the pages while holding a babe). This particular board book is a must. 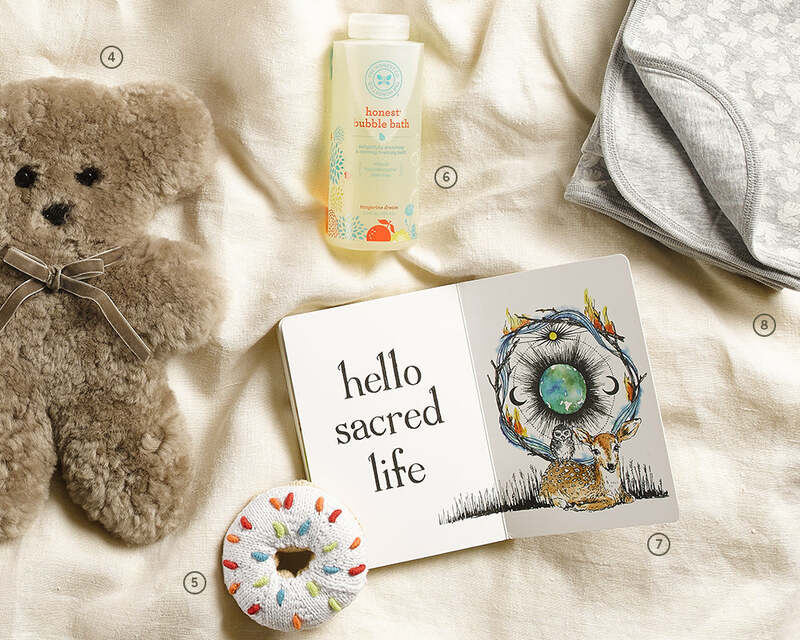 Hello Sacred Life is a colorful, mesmerizing book with words as beautiful as the illustrations. We won’t tell anyone if you keep it for yourself.